Chou Chou! 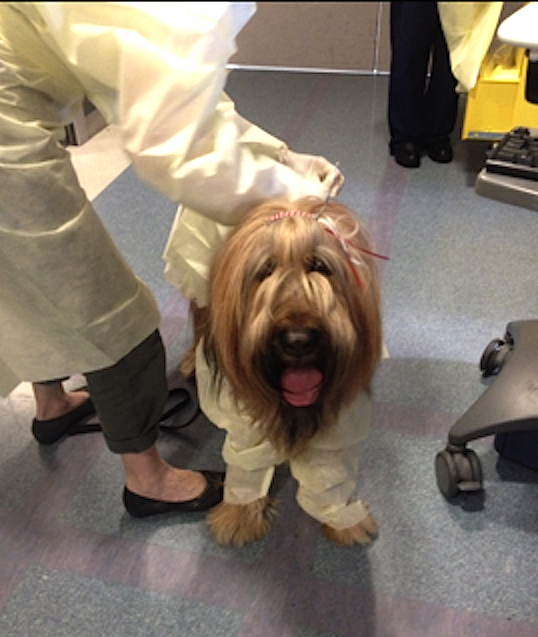 Adventures of a Briard Girl : Chou Chou Briard: Best Therapy Dog Ever! My mom has been in the hospital, in the ICU, and is very ill. We were not on a therapy team visit, but the nurses let me bring Chou Chou to cheer my mom. Because my mom is in an isolation room, we all had to cover up with disposable hospital gowns when in her room, so as not to spread bacteria. Chou Chou was no exception. The gown went around her and tied, with her front legs through the sleeves. ("Too long for briards! We had to scrunch them up so I could walk!") 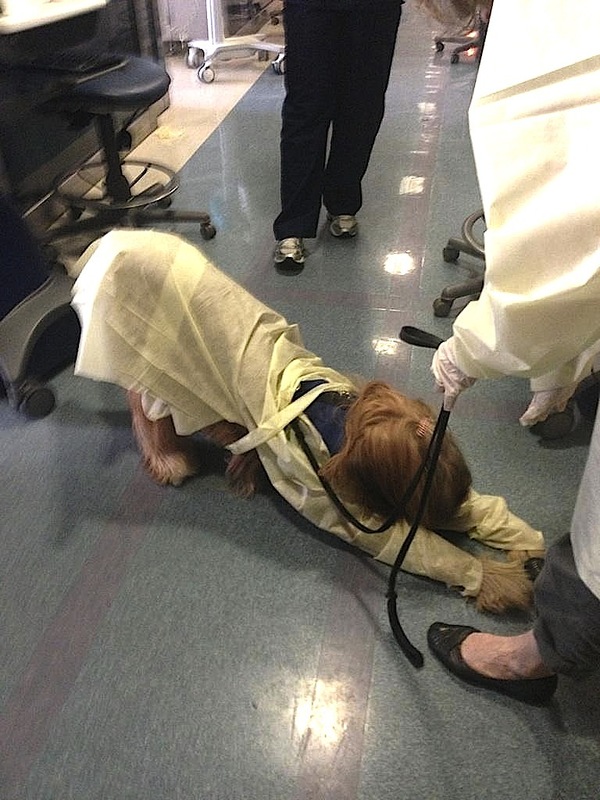 The nurses put a blanket on the floor for her to walk on, to keep her paws clean. The nurse announced, "Chou Chou's here!" My mother lit up. Chou got up on a chair at bedside ("Very squashy!"). My mom reached out her hand; Chou Chou nuzzled. My pup was a gift from my mom 3 years ago. They have a special bond. After my mom fell asleep, we left the room, and Chou Chou went around the ICU to give the nurses a brief respite from their rewarding but intense work. As they watched and petted her, she gave them a bow. ("It was good of them to let me come!") We were on one side of the unit and the nurses at the other end yelled out, "Come over this way! We need a little love, too!" Then some patients' families started coming out of the rooms to see and touch the visiting, albeit off-duty, therapy dog. Chou Chou went to each person and brought smiles to their faces. Large carts rolled by, but Chou Chou was not frightened by noises or equipment. She had a job to do. And she has never done it better. She brought some solace into the ICU, to my mom ... and to me. It's been almost unbearable for me to see my mom so ill; Chou Chou has been a comfort. 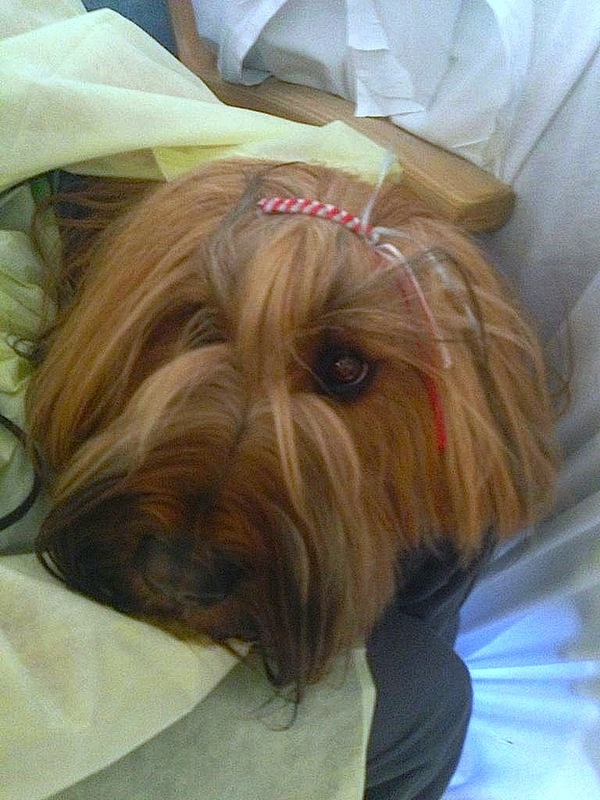 A Therapy Dog Par Excellence! Sending Lots of Golden Healing Thoughts to your mom. Golden LOVE <3 n you are the best Therapy Dog. Words don't always help from visitors but love from an animal especially with fur is priceless! It is a while since this post....I hope you Mum is on the mend? As a fellow briard owner from the UK, it is so lovely to see Chou Chou left as nature intended! Thank you for your kind words about my Chou Chou, Lynne. And thank you for asking about my mom. She made it out of the ICU to a regular hospital room (where Chou Chou continued to visit with me), but no further. She died June 30. I finally added a post about it, right after this one, The Day the Adventures Paused. I am grieving.